Blanca Millan of the University of Maine shoots over the University of Maryland, Baltimore County's Laura Castaldo during Saturday's America East women's basketball quarterfinal at Cross Insurance Arena in Portland. The Black Bears advanced with a 65-43 victory. 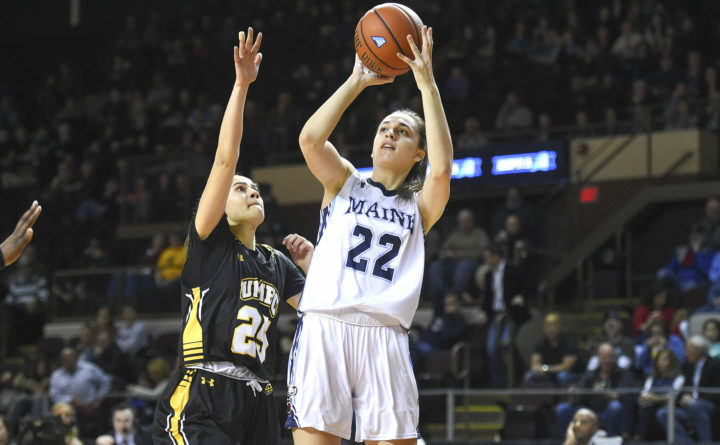 Blanca Millan and her University of Maine teammates had a frustrating first half during Wednesday night’s America East women’s basketball game against Vermont at the Cross Insurance Center. But it was a completely different story in the second half as the Black Bears rattled off an 18-0 run spanning the third and fourth quarters en route to a 66-45 victory. It was the fifth consecutive win for UMaine (16-7 overall, 9-1 AE), which has won nine of is last 10 games. Vermont fell to 9-13 and 5-5, respectively. The Black Bears led just 23-19 at the intermission but scored the last eight points of the third quarter and the first 10 points in the fourth period to build a comfortable 58-32 lead over the taller Catamounts. Millan, a junior guard who is the league’s leading scorer (17.2 points per game), shot just 2-for-13 from the floor in the first half and the Black Bears were a combined 10-for-36 (27.8 percent). But Millan made six of seven shots in the second half and hit all four of her 3-point attempts to help the Black Bears post a a collective 16-for-25 effort, including an 8-for-10 showing from the 3-point arc. Millan scored 10 of her points during the 18-0 run as the Black Bears went 6-for-8 with four 3-pointers. Senior guard Parise Rossignol hit a pair of 3-pointers and Fanny Wadling capped the flurry with a jump shot with 7:10 remaining. Vermont went 0-for-8 and turned the ball over four times during that scoreless stretch that lasted 5:18. UMaine coach Amy Vachon said during intermission the Black Bears talked about being confident shooters in the second half. “That’s a huge thing. If you get enough good looks, the shots are going to fall and you saw that in the second half,” she said. Millan also provided six rebounds and two steals. Rossignol contributed 14 points, three steals and three assists and Sutton posted 12 points, seven rebounds and five assists. Dor Saar supplied nine points, six assists and two steals. Fanny Wadling chipped in with six points, five rebounds and four blocked shots. Josie Larkins netted 19 points and five rebounds to pace Vermont. Hanna Crymble tallied six points, five rebounds and three assists. Lauren Handy had five points, five rebounds and two assists and Candice Wright had five points, eight rebounds, two steals and two blocks. Nobody scored for the first 5:40 of the second period as UMaine clung to a 16-15 lead. UMaine missed its first eight shots of the quarter while Vermont went 0-for-4. Rossignol finally ended the drought by nailing a 3-pointer off a pass from Kira Barra, who had just entered the game. Courtney Wright answered with a runner and Sutton restored the four-point cushion with a four-footer in the lane following a nifty spin move. Larkins converted an offensive rebound with a floater from the middle of the paint before Sutton’s 12-foot jumper to the right of the foul line gave UMaine its 23-19 intermission lead. UVM’s four points in the quarter were the fewest allowed by the Black Bears in a quarter this season. Vermont played the final 7:48 of the quarter without leading scorer Crymble (15.2 points per game), who had picked up her second foul. UMaine visits the University of Maryland, Baltimore County (8-14, 1-8) at 1 p.m. Saturday.